The cinquefoil knot 5_1 is one of two 5-crossing knots. The conformation we chose for this knot is a <LINK>lattice conformation<LINK>, which means that it follows only perpendicular directions in 3-space. In other words, this conformation is obtained by connecting integer-valued coordinates in space with straight lines. 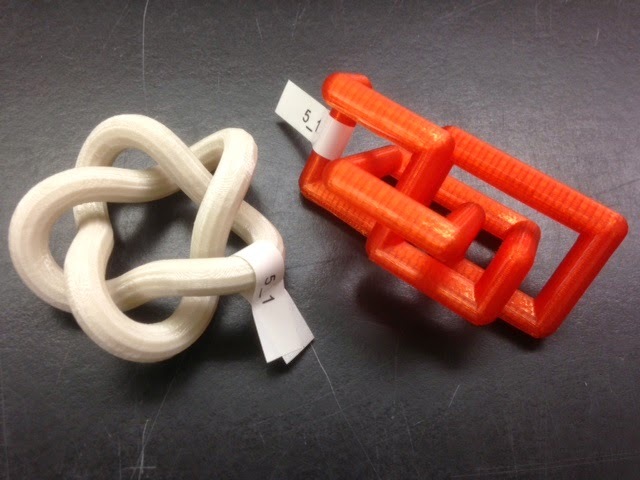 Settings: Replicator 2 with our usual custom support settings for knots. The lattice stick number for a knot is the minimal number of line segments required to construct that knot on a cubic lattice. While a stick configuration of a knot can consist of sticks of differing lengths, a lattice configuration is thought of as a collection of sticks of unit length. This means that if a knot on the cubic lattice has an edge that extends from, say, (0,0,0) to (0,0,3), then that length-three edge is considered to be three unit-length sticks lined up from end to end. It generally takes many more line segments to create a minimal lattice knot than to create a minimal stick knot. In fact it was shown in 1992 by Diao that the minimal number of sticks required to build a non-trivial knot on a cubic lattice is 24 (and that all such knots are trefoils), where we saw on Day 269 that the knot 4_1 can be made from just 7 variable-length non-lattice sticks. Today's 5_1 lattice knot is realized with 34 lattice points and therefore the lattice stick number of 5_1 is at most 34. However, it has not yet been proven that this is the minimal lattice knot configuration for 5_1.